An interview with PJ Kwong. Ms. Kwong is a Canadian figure skating coach, television commentator, public address announcer, blogger at www.pjkwong.com, and author of “Taking the Ice: Success Stories From the World of Canadian Figure Skating.” We talk about how she got into commentating for television, why Canadian choreographers are so talented, and she reveals what her initials “PJ” represent. 1 hour, 5 minutes, 26 seconds. Win a copy of PJ Kwong’s Book! 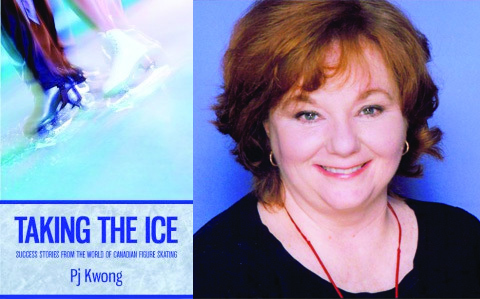 One lucky winner can win a signed copy of PJ’s book, “Taking the Ice: Success Stories From the World of Canadian Figure Skating.” It’s a wonderful book for any skater’s library, and it gives a terrific overview of Canadian skating through interviews with many of Canada’s brightest stars. To enter, send me either through email, twitter or my Facebook page the answer to the following question about Canada: how many Winter Olympics have been held in Canada? All entries received between November 23 and December 21, 2011 are eligible. The winner will be picked at random from all correct entries sent. Click here to learn more about how to enter. On all the different jobs she has had in her career: You’ll get no complaints from me. I’m surprised as anyone to have landed where I have. And when I look back on it, it’s like each thing seemed to prepare me for the next. It’s very strange. But you know what? If I weren’t me I’d want to be me too [laughs]. It’s been a pretty interesting ride so far, with more to come, I’m hoping. On her most embarrassing figure skating moment: I’ve got a really good story that’s the truth, and it’s one that I share with my students when they get really upset about a result or whatever. When I was eight years old, I had pretty much the same body type I’ve had all along, meaning adorable yet somehow dumpling-like. So not the typical skater’s body. And my classmate Clifford Jansen, who now lives on the West Coast [of Canada] with his wife Pamela, and they’re adult skaters now, he and I were put together by my coach Wally Distelmeyer to be a little dance pair. And we were adorable, but Clifford, not only were we classmates but he was at a phase where he didn’t particularly like girls. At the time, holding hands with a girl was not his most favorite thing to do. So practicing became a bit of an issue. And then for some reason his mother decided that it would be a good idea that in addition to being a little dance pair, we would be a little freeskate pair. 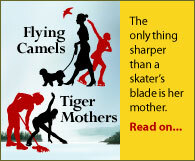 Now Mr. Distelmeyer didn’t feel that this was the world’s best idea, but Clifford’s mother persisted and my mother kind of went along with it, so we ended up as a little freeskate pair. So we competed in our club carnival, let’s say around 1967. And Mr. Distelmeyer had given us some music, Sorcerer’s Apprentice or Night on Bald Mountain or something like that, very very dramatic, it could have been its generation’s Carmina Burana. It was not particularly suitable for eight-year-olds, even more so for eight-year-olds that wouldn’t skate together holding hands [laughs]. So we weren’t as well prepared as maybe we should have been. In any event, we competed and we came second. The only problem was that we were the only team that competed. So we came second in a field of one [laughs]. Which was terrible! I was mortified. Now at the time skaters had to skate to a standard, so if you were the only person in the event it was possible to come in second. But when I tell today’s skaters that I came in second in a field of one, and I’ve been in therapy ever since, they don’t believe me. But that is without a doubt one of the more embarrassing stories. On how being a coach affects her skating journalism: To tell you the truth, my interest in journalism, my interest in reporting has always been about the human aspect of the stories. The fact that I’m a coach gives me a bit of a shortcut as to what people may be thinking, or how they’re experiencing things, or what they’re doing. But I think that in truth what I’m more interested in is and what I have a keener sense for is, what is the story – putting myself in that person’s shoes and how they might be responding or reacting. Now what coaching does do for me is give me credibility in certain situations and with people who don’t know me. 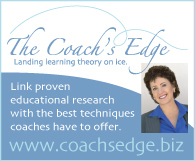 So I can approach a legendary coach and say “I am also a coach” and they immediately realize that you’re a skating person, and it becomes a kind of a shorthand exchange – where if they think you’re strictly working for a newspaper or a website or television or whatever, they might not be as candid, or you might not be able to get the same answers that I can as a result of coaching. On how she started as a television commentator: I have a very strange, strange life, in that if somebody says to me, “Hey! Would you like to do this?” [I say yes]. I’m a risk taker and I’m adaptable. And I take the work seriously, but I don’t take myself seriously, and I’m willing to make mistakes along the way. What happened was in 1999 – OK, I started doing commentary first for synchro, and Rod Black [Canadian TV sports announcer] didn’t want to do synchro with Debbi Wilkes [Canadian TV sports announcer]. So they needed a second person, and I was asked if I wanted to do it, because I knew synchro, so I just said “Sure! Why not!” And I’m sure I was terrible, but I was better than nobody, and I made a commitment to myself that I was going to get better. And oddly enough, as the world kind of moved on, by the time the world figure skating championships were in Canada, in 2001 in Vancouver, the ISU had organized that they wanted each of the host broadcasters [for major events] to [provide] a guide track commentator, meaning they wanted a commentator who was able to do all of the events and all of the skaters. And they really only wanted one person, because it was going to get complicated to hire more than one person. And what they found was, they could either find people who spoke English who didn’t know skating, or they found skating people who spoke English who didn’t know ice dance, and I was a person who could do all of it. So that’s how I started with the broadcasting stuff in earnest. I’m not a trained journalist – I’m not a trained PA announcer either – so maybe if I were trained I would have a different perspective [on not being anonymous on social media]. Maybe there are certain guidelines I would follow, but I don’t really care. For the way that I work, it’s as a freelance person, like for all my little skaters and their parents, if they drive me crazy I can get rid of them. So it’s the way that I’m kind of built. I’m somebody who believes in saying, here’s what I think, here’s my name, here’s my contact information, feel free to contact me, and let’s have an exchange about it. On working as the rink announcer at the 2010 Olympics: One of the reasons that I think I’m a good announcer is that I don’t really get too involved in any of the sports and what’s going on at the field of play. For instance, when I was in Vancouver and Joannie Rochette came and did the short program [after her mother had passed away three days before] I knew if I watched her I wasn’t going to be able to do my job. So as much as I wanted to see what she was going to do, I knew that I sort of had to keep myself distracted, or I was going to get swept up in the emotion of the moment. Because it was….unbelievable. But my job was to be the PA announcer. So what I had to do was basically distract myself throughout her entire performance. I didn’t even look at her bows, I just sort of looked at her quickly on the monitor to see where she was, to do the tag line. And then I got through her marks and got on to the next skater. And the reason why I felt that was important was I thought, you know, this moment is in no way about me. This is about this Olympian. And I may not detract from that in any way with my own story, my own feelings, whatever. The best possible thing that I can offer this event, offer this young woman, offer the rest of the women skating, is just to be exactly the same for her as I was for the skater before her and the skater after her. On writing her book, Taking the Ice: You’re going to laugh, because it happened like everything else. The publisher wrote me and said, I’ve been following you for a while, would you like to write a book? And I said, “Sure!” without any more thought than that. See, that’s the problem with me [laughs]. So we met, and the only thing he wanted was that the Canadian champions, the possible Olympians – I was right, thank goodness – would all be in the book. And I said, “What should it be about?” And he said, “You’re the writer, you figure it out” [laughs]. So I got to write the book I wanted to read. I hoped to write a book at some point, and I’d love to say it was some sort of angst-driven story, but the hard work began as soon as it was put to me and I said, “Yeah, you know what, I’d like to do that, I bet I could do that, I’d like to try.” The worst thing that can happen is it will be the only book I’ve ever written, but either way, good book or bad, you’re still an author. On the judging scandal at the 2002 Olympics: We were all shocked. Truly, all shocked. It’s not to take anything away from Elena and Anton, who are wonderful skaters, but to my mind, on that day, the Canadians won. Elena and Anton didn’t do anything wrong, no matter what other shenanigans went on, but you can’t take away a title that they’re earned. So in my mind, [giving two gold medals] was the only possible outcome. I didn’t know that anybody knew [about the alleged predetermined outcomes], that’s how little I knew about it. We all heard it at the same time, about the judging scandal, but [for the book] when I interviewed Lori Nichol, [she had heard rumors beforehand], and Benoit Lavoie, who’s the president of Skate Canada and who was on the judging panel, he had also been tipped off by Marie-Reine Le Gougne herself [the French judge accused of cheating]. And how many times have we heard rumors in the skating world all over the place? But when you’re doing your own job or your own function, you’re not always looking for clues for what’s going on. But the interesting thing about any event, you have your own little section of work life, so people hang together, the judges hang together. So I would know more maybe about coaches and skaters, and the judges would know about the judges, and the skaters would know about the skaters. So we all have our little intersecting circles that we hang with. So the fact that all of this came out was a huge surprise, to me anyway. But obviously other people knew, because the event coordinator kept the French judge on the stand, would not allow her to pass behind us to get off the stand, for the medal ceremony. And I kept looking back at her, and she had her fingers to her forehead, rubbing her forehead as if she had a really bad headache. And I kept thinking, there’s that nice French lady, maybe she needs an Advil [laughs], without any more idea than that. But I couldn’t figure out why she was being blocked from leaving the stand. So it wasn’t until much later on that the pieces got put together. On why Canadian choreographers are so good: [David Wilson, Lori Nichol, and Sarah Kawahara] were all honest skaters, not world champions, just beautiful skaters. And they all have the soul of an artist, Marina [Zoueva] as well, and they just see things in a different way. So I think it’s kind of serendipitous that they all come from the same area. What I do really appreciate about David and Lori’s work in particular is that they seem really to be able to find the heart of a skater. I was at a Toronto-area rink a few weeks ago and Lori was there working with Zhang and Zhang [Chinese pair skaters] and she just seemed to really be able to connect with them. And she’s said to me at times that she didn’t really even need a translator, that it was like they were in each other’s heads. And David can do the same thing – he has a way of capturing the essence of the person. It used to be in days gone by that people would get a piece of music and impose the choreography on the skater, and that still happens lots, but what makes these people so special is that they get inside the skater and find what’s there and help the skater bring it out. I love that about them. Sandra [Bezic] is very artistic, very creative in her own right, and I think all those years producing Stars on Ice has given her a movement vocabulary that is very playful. They’re all warm, wonderful people, and if you get a chance to play with skaters, you can often draw the best things from them. So I think that’s the secret. On what “PJ” stands for: You know what I tell all my little skaters? “Pure Joy”. [laughs]. I could tell you, but then I’d have to kill you [laughs]. It’s totally mundane, it’s “Patricia Joanne”. But when I tell my little skaters that, they go “Really?” And I say, “No. Go do outside edges” [laughs].